While presumptive Republican presidential nominee Donald Trump has seemingly done a better-than-expected job of uniting the Republican rank-and-file after dispatching his presidential rivals, he continues to face elite opposition from some GOP leaders and opinion-makers. Rumors of a third-party presidential bid designed to give #NeverTrump Republicans an option continue even if, frankly, that seems less and less likely by the day, as independent filing deadlines are approaching or, in the case of Texas, have already passed. That could leave disaffected Republicans searching for an option, which probably will lead to the Libertarian Party having its best presidential election ever. But that might not be quite as impressive as it sounds. The Libertarian Party was founded in 1971, and it first fielded a presidential candidate, philosopher John Hospers, in 1972. Hospers won less than 4,000 votes, but he received an electoral vote from a faithless Richard Nixon elector from Virginia. Four years later, that faithless elector — Roger MacBride — won 0.2% as the Libertarian nominee. The party, which bills itself as the “third largest political party in the United States,” has fielded a presidential candidate in every election since 1972. Generally speaking, the Libertarians haven’t had much success: Only once has a Libertarian received more than a percentage point’s worth of support, which was 1980, when Ed Clark won 1.1% of the vote in an election that featured a more credible third-party alternative, moderate Republican John Anderson (who ran as an independent). Clark’s running mate that year was David Koch, the wealthy industrialist who along with his brother Charles spend considerable amounts of money backing conservative candidates and causes. Former New Mexico Gov. Gary Johnson won 0.99% of the vote as the 2012 Libertarian nominee. Four years later, he is poised to capture the party’s nomination again at a convention this weekend in Orlando, although others are competing against him, including bizarre cybersecurity pioneer John McAfee. Johnson’s running mate is William Weld, a colorful former Massachusetts Republican governor who unsuccessfully challenged then-Sen. John Kerry (D) in a spirited contest back in 1996. Two recent polls that have included Johnson as an option, one from Fox News and the other from Morning Consult, have shown him getting around 10% of the vote in matchups with Trump and Hillary Clinton, and taking about equally from the two major-party candidates. Libertarians tend to draw more support from Republican-leaning voters, but the socially liberal Johnson and Weld could attract disaffected Bernie Sanders supporters to their camp, as well as some anti-Trump Republicans. Still, it’s far from certain that Johnson, if nominated, will be a major factor in the election. For one thing, we would not expect him to win any states. Even Ross Perot, who won 18.9% and 8.4% of the vote, respectively, in his 1992 and 1996 runs, did not capture a single electoral vote. Additionally, even polling at 10% would not get Johnson into the presidential debates: The Commission on Presidential Debates’ current threshold for debate inclusion is 15% in an average of five selected national polls. Pre-election polls also tend to overstate the prospects of third-party candidates, and as Election Day nears, their numbers usually shrink. Many partisans who fear a Trump or Clinton presidency may come home to their preferred party by November, which could depress the Libertarian vote. Might there be a swing state where Johnson impacts the outcome? Possibly, and if so, it’ll likely be a state in the western part of the country. In 2012, Johnson won at least 1% of the vote in 27 states, and at least 2% in four states, including 3.5% in his home state of New Mexico. But only seven of those states were east of the Mississippi River. And his strongest states included few real battlegrounds in 2012: Though he won more than 1% in Colorado, Nevada, and New Hampshire, they were well down the list for him. It’s possible that some other states where he did fairly well in 2012 might be battlegrounds in 2016, such as Arizona, and perhaps he’ll win more of the vote in his home state of New Mexico this time around. 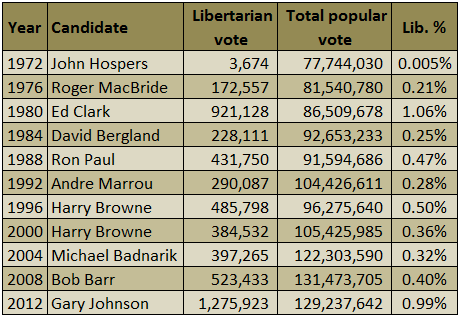 However, as early polls suggest that the Libertarian ticket is taking about equally from the two major parties, it’s tough to say if the party will notably affect the 2016 outcome. Historically speaking, Johnson’s 3.5% in his home state of New Mexico in 2012 was the third-best state result in the party’s history, though he obviously benefited to some extent from having been a statewide elected official there. Johnson’s greater success in the western United States continued a pattern for the Libertarians: Of the 70 times where the party has won at least 1% of the presidential vote in a state since 1972, 58 of those results came in states west of the Mississippi River. 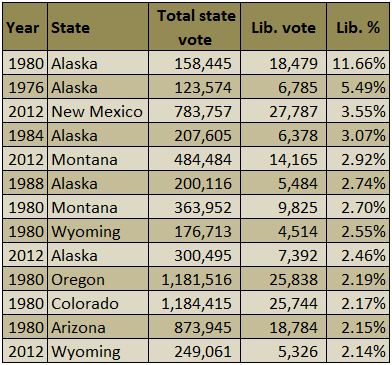 As shown in Table 2, Clark’s 11.7% performance in Alaska in 1980 remains the only time the Libertarian nominee managed to win over 10% of the vote in a state. So for the time being, the most we can say for the Libertarian ticket is that it could prove to be a destination for voters put off by Clinton and Trump, a “none-of-the-above” choice to some extent. 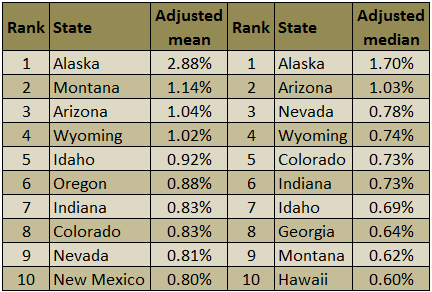 We can also expect the Libertarians to do best west of the Mississippi, and given the major-party competition, the party is well-positioned to perform better this year than it ever has previously. But whether the Libertarians will truly be a major factor when the country votes in November remains to be seen.